The weekend is here, so what would be better than some smart, yet still casual style inspiration from the trusted shirt makers, Thomas Pink? We love their 'dress to un-stress' feature, and have chosen some pieces from their collections for some outfit inspiration for those casual weekends this summer. 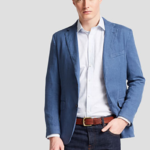 First up we love the Wyndham Slim Fit Chinos (£95). Still casual, but a little bit smarted with the tailored cut. You could easily smarten these up with a shirt or blazer, or just throw on a polo shirt and some converse for a relaxed look. 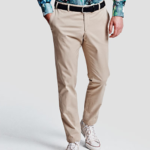 Next be sure to accessorise the chinos with a casual belt. We love this woven Carisbrooke (£80) belt shown in the picture to the left. For the top half, go for a pale blue polo shirt such as the Birch Plain Classic Fit Polo (£65). 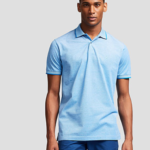 The light blue will compliment most skin tones, and the polo style is perfect for summer. Throw on a light weight jacket for a little extra layer for colder days. Try the Ray Jacket (£115) paired with a pair of the navy chinos. For an alternative, try this Sutton Texture Classic Fit Button Cuff Shirt (£79) and throw on a casual blazer, for a smarter look. We love the Shaw Jacket (£295).